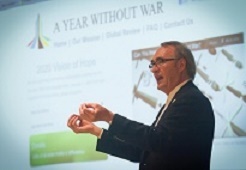 Prof. Joseph White is the Founder, and Executive Director of 2020 A Year Without War, and Chair of the Board of Directors. Professor White has served as the Chair of the Dept. of Philosophy at Santa Barbara City College as well as a visiting lecturer at other colleges and universities. He was most recently nominated as United States Professor of the Year. He has also been selected as the SBCC Faculty Lecturer of the Year. He has worked as a screen/television writer represented by the Lenhoff & Lenhoff Agency, LA. Professor White has Baccalaureate Degrees in Psychology and Philosophy. He also has an M. A. degree in Philosophy from the University of Calgary and an M.A. in Philosophy from the University of California, Santa Barbara. He has served on the Board of Directors for the Rupe Foundation, Santa Barbara City-wide Humanities Committee, as the Executive Director of the Center for Philosophical Education, and Editor ofthe International Undergraduate Journal, STOA along with coaching a number of his kids sports teams. He presently also serves as Ambassador for Flying Goat winery. Brooks Reynolds is Chief Executive Officer, and President for 2020 A Year Without War. He is also a member of the non-profit foundations Operating and Executive Committees. Prior to joining A Year Without War in 2015, Reynolds was Executive Vice President for JP Morgan Chase in the Consumer Finance Division from 2006 to 2010. He also was Senior Vice President for CITI Group in the Risk Management Department as well as holding many Senior level positions throughout the organization from 1994 to 2006. Mr. Reynolds holds a Bachelor of Science degree in Economics from the University of California Santa Barbara, and also attended Marquette University for additional continuing education in business analysis in 1996. A native Californian, Reynolds has coached for Little League and worked as a volunteer with the United Way, The Boys and Girls Clubs of America, and the Special Olympics. Fundraising Director Dulcie is the Co-founder and fund raising coordinator for 2020 AYWW, and hopes to make a difference in the lives of children around the world. Dulcie enjoys empowering others to step into leadership positions, build community collaborations, and find their voices in causes that support opportunity, education, and respect. In the past 40 years, Dulcie has worked for small businesses, UCSB, the City of Lompoc, and numerous non-profits. 2020 A Year Without War Ambassador Lorenzo Marchetti is an International Affairs candidate at Elliott School of International Affairs at George Washington University. After earning his bachelor degree he would like to work in the international arena in the field of conflict resolution. He became involved with 2020 AYWW after meeting professor Joseph White at Santa Barbara City College. Since he joined 2020 AYWW he focused in developing the global network for the organization. In this context he led the 2020 AYWW delegation at the UN International Day of Peace the 16th September 2016 and the delegation at the World Summit of Nobel peace Laureates in February 2017 in Bogotà, Colombia. Currently he serves as the International Ambassador for the organization, Executive coordinator of the Student movement and President of 2020 A Year Without War Italia.